At age 52, Rick Sterling did not have any symptoms of colorectal cancer but he did have a family history, so Mr. Sterling scheduled a colonoscopy. That screening resulted in a diagnosis of cancer and he was referred to board certified Colorectal Surgeon Dr. Erik Grossmann and his team at Columbia Surgical Associates. As of March 2nd, Mr. Sterling is 5 years cancer free. 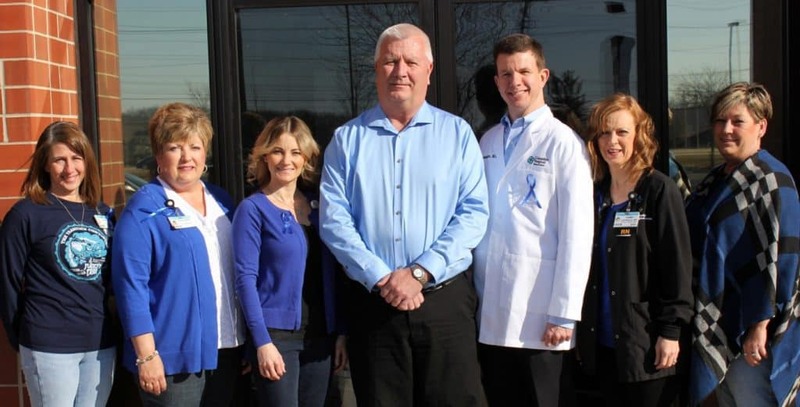 We wear blue to recognize Mr. Sterling and all patients who are battling colorectal cancer and the importance of regular colorectal cancer screening. Pictured with Mr. Sterling and Dr. Grossmann are CSA staff Sharon McCoy, Stephanie Long, Tiffany Gilpin, RN, Tammy Chitwood, RN. and Deb Dorman, all part of the team who have worked with Mr. Sterling over the last 5 years. Board Certified Colorectal Surgeon, Dr. Erik Grossmann shares risk factors for color cancer.